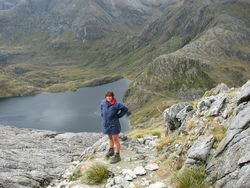 Since the 1880's the Routeburn Track has proved to be one of the most accessible and popular New Zealand hiking adventures. 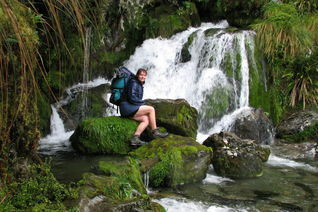 The Routeburn Track passes through two national parks, Fiordland and Mount Aspiring, and is part of Te Wahipounamu, South West New Zealand World Heritage Area. The area is a haven for native birdlife: the robin; fantail; parakeet; bellbird; yellowhead and watch out for the resident kea at Routeburn Falls! The variety of landscapes will astound you: mountainous peaks; sheer rock faces; alpine basins; pristine lakes; cascading waterfalls; luxuriant forest; turquoise rivers and million dollar views around every corner. The Routeburn Track Guided Walk is a 3 day / 2 night Queenstown to Queenstown all-inclusive walk, exploring New Zealand's Southern Alps. The package includes all transport, accommodation, meals, snacks, backpacks and rain jackets. Accommodation is in comfortable lodges and you will be led by experienced guides. On the afternoon before your departure you are required to attend a pre-track briefing in Queenstown at 3:45pm. Here you will receive a complete outline of what to expect, be provided with equipment, given an opportunity to purchase last minute required items, complete the required medical forms, ask / answer any last minute questions that you may have, and meet your fellow walkers. Your adventure begins with a coach ride from Queenstown to the Divide, on the scenic Milford Road, stopping at Te Anau for morning tea. You will climb the wide and well formed track from the Divide to the optional ascent to Key Summit. 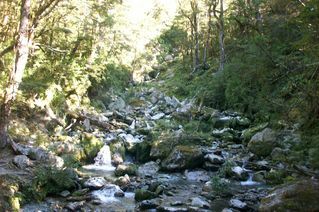 Here you can sit among the alpine plants and gaze down three valleys from which water flows to three different coasts. You then descend to Lake Howden hut for a hot drink and picnic lunch, before gradually climbing through lush silver beech forest to the base of Earland Falls, quite a sight in wet weather! You will look over the Hollyford Valley to the ice capped Darran Mountains before descending to the splendid lodge at Lake Mackenzie where refreshments, a hot shower, three course meal and comfortable beds are waiting. You leave the ancient forest draped in moss and lichen and enter the world of daisies, buttercups, gentians and edelweiss. 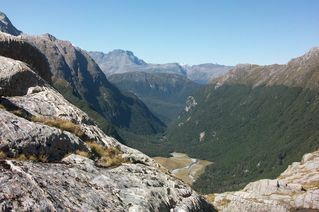 Here you have a full vista of the Darran Mountains across the Hollyford Valley, which slices through Fiordland to the distant Tasman Sea at Martin's Bay. 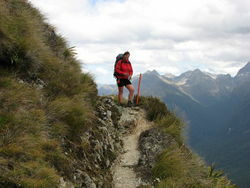 After lunch at the Harris Saddle, you can ascend Conical Hill for a panoramic view of the surrounding peaks. After walking around Lake Harris you descend into the upper basins of the Routeburn Valley, with the towering mountains above. Spend your final night of luxury at the beautifully located Routeburn Falls Lodge where you will be treated to a special dinner. Take time to enjoy the dramatic landscape around the Falls, before descending to the alpine pastures of the Routeburn Flats. Your guides will take the scenic route through the meadows and find the deepest green pool for you to picnic beside. The track shadows the river as it roars through a magnificent gorge, before plunging beneath the unyielding rocks at the Sump. From here it is a gentle walk through the beech forest to the Road End. A coach will take you back to Queenstown, stopping at the small town of Glenorchy on the way. Many of New Zealand's bird species are threatened. Clients who walk the Routeburn Track are contributing in a small, but significant way to the breeding and release programme of the endangered pateke. BOOK A CENTAL OTAGO WINE TOUR WITH iTREK AND RECEIVE ONE NIGHTS FREE ACCOMMODATION WITH YOUR iTREK HOSTS. Trek Dates: 5 days per week. Depart, Mon. Tue. Wed. Fri. Sun. 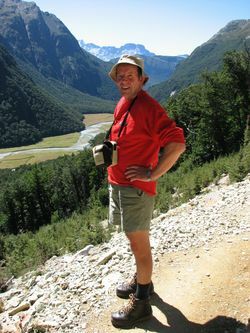 For a package price including accommodation pre & post hike the track and any other activity or transport, Contact George.